I'm 37 and until the last couple of years, Formula One was no more than a memory for me of Sunday lunchtime's sleeping off a roast dinner and the half a bitter shandy dad let me have if I behaved myself. That changed with a combination of meeting my Button-loving girlfriend and the persistence of my anorak-like F1 fan best mate. What followed were a million questions about DRS and why at the time the sport seemed to shoot itself in the foot by arguing with itself. Then gradually I started to make sure qualification had a space in my weekend schedule before following the football at 3pm. I am actually writing this today during Monza qualies! With the growth of my Twitter account there were people to follow. First drivers then commentators and of course I was introduced to Sidepodcast tweets and podcasts. Don't get me wrong, I couldn't explain KERS or talk you through car setup in the slightest, but what started as an interest to keep up with conversations grew to the sport gaining another fan. So, inevitably, and the reason for this post: I had to see a Grand Prix Live. 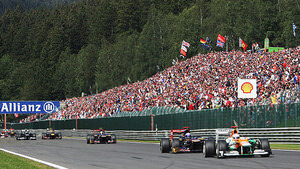 Through a series of my own circumstances and like most people, an F1 race is something I genuinely can't afford to go to so I was delighted when my brother invited me, as a birthday present, to the Belgian Grand Prix. I jumped at the opportunity and we made a long weekend of it, spending a couple of days in Brussels drinking beer first! My brother isn't a massive fan so it meant some time being a tourist and the intention to grab an early train from Brussels to Liege on the Saturday morning in time for final practice. The plan was going well. We left the hotel about 6.30 am, caught our trains (Metro then Rail) and dropped the bags in lockers at Liege with plenty of time. Now my excitement began to grow as I began to wake! We did our homework and everything we read told us that if we got the train to Verviers Central we could pick up the shuttle bus to the track. There would be special buses and they would take about 35 minutes. So...here is where it went a bit pear shaped! When we arrived at Verviers you would genuinely have been surprised to hear there was a race on. It was all a bit like a ghost town. Bernie's multi-million pound industry/sport hadn't raised the tenner it would cost for a couple of nicely printed, F1 logo adorned posters welcoming us and leading the way. No, it was only a few minutes later when a few of us Brits were scratching our heads that we confirmed which number bus people thought we could get. After half an hour waiting, said bus arrived and the chaos began. I can now say that there were a combination of 'specials' and regular buses. So, people paid and others didn't need to and we were all crammed in to buses that wouldn't go till every seat and inch of floor was covered. Oh well - these things happen I told myself, away the bus went and once again up a notch went the excitement. We looked out the window at a beautiful day. Now I'd been told by those who follow F1 that it always rains at Spa so I'd duly gone out and bought a rain coat. News had filtered through that Friday had been a washout so this was a turn up for the books. What I didn't know at the time was quite how helpful this would be because about half way into our journey we hit a snag! Apparently nobody seemed to remember that a lot of people wanted to head to a specific place i.e an international Grand Prix circuit and the traffic ground to a halt. What followed was confusion and then a few miles walk to the circuit. Some have said eight miles but I'm not sure. Either way, it was daft. We didn't know where we were and basically had to follow everybody else. It certainly wasn't the way I assumed my virgin Grand Prix experience would begin! That said, apart from the worst beer of four days in Belgium, the second we arrived on the circuit the experience was worth every penny. We just about made it to La Source for the end of practice and the sound of a Formula One car live for the first time will live with me forever. Qualifying went to plan from up in the trees and we had a great time in the sun all weekend... apart from trying to get away from the circuit by bus of course! As a newbie I am sure that many of the more experienced will be able to tell me other F1 events are better set up but I do feel that if you are taking that much money from people they deserve better organisation. Still, I'll most certainly be sticking about for more... roll on that lottery win.